Montreal area home sales outpaced Canada's other large markets by hitting another record high for May even as the pace of growth cooled from a year ago, the Greater Montreal Real Estate Board said Wednesday. Sales grew one per cent to 5,303 homes sold in May, based on the real estate brokers' Centris provincial database. The sales growth slowed from about a 16 per cent increase a year ago after the Saint-Jean-sur-Richelieu area southeast of Montreal was added to the monthly surveys. The May sales compared with a very strong month a year ago, said Paul Cardinal, manager market analysis for the Quebec Federation of Real Estate Boards. "At that time it was a record year for the month of May and now we're just one per cent higher which doesn't seem very spectacular but still it's a record number," he said in an interview. It also compares favourably with real estate markets in Calgary, Vancouver and Toronto, where May sales fell by 18, 35 and 22 per cent, respectively, compared with year ago. Montreal area condominium sales climbed 14 per cent compared with a year ago. Meanwhile, sales of single-family homes were down six per cent while plexes, which include two to five units, rose four per cent. 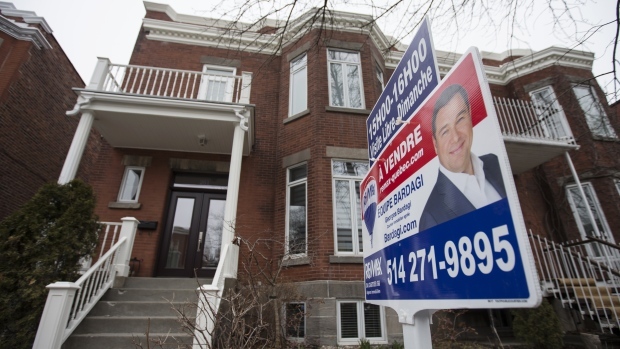 The average price of all properties in Greater Montreal increased five per cent to $373,899. They were up six per cent to $481,544 on the island of Montreal. Average prices in Calgary decreased 2.8 per cent and by 6.6 per cent in Toronto. Vancouver prices rose 11.5 per cent. Sotheby's International Realty Canada said the luxury real estate market on the Island of Montreal is on track to set new records in 2018. A total of 367 properties sold for more than $1 million in the first five months of the year, an increase of 17 per cent from the same period in 2017. That's on top of a 20 per cent gain in the prior year and 23 per cent increase in 2016 over 2015. Luxury condo sales increased 51 per cent to 136 units in January through May, with 21 per cent of the transactions exceeding the list price, it said in a news release. A luxury 4,015 sq. ft. condo listed for $8.05 million at the Four Seasons Private Residence to set a Montreal sales record for price per square foot. Sales of luxury detached homes were more muted, rising two per cent to 171. "Montreal has a very stable political environment as of late and I think people have more confidence in the Montreal marketplace now and going into the future," Sotheby's Canada CEO Brad Henderson said in an interview. "I also think that the Montreal marketplace is playing a little bit of catch up to the rest of Canada." Henderson said there has been some shift in luxury buying to Montreal because of foreign buyers taxes in Vancouver and Toronto. But that is a small number compared to domestic buyers who see value in Montreal housing. Cardinal said the luxury detached home market outperformed the overall single family home segment across Greater Montreal. Luxury sales rose 40 per cent in May and by 16 per cent between January and May. That compared with a six per cent decrease for overall single detached home sales for the month and a one per cent increase over the five months. Sales of luxury condos were similar to overall condos, increasing by 14 and 16 per cent respectively in the five months. The increase in Montreal area sales came as the number of active listings fell 16 per cent to 24,501 as the number of new listings was down one per cent. The supply of condos for sale was even worse, decreasing by 22 per cent in May, a situation not seen in nearly 15 years, said Greater Montreal Real Estate Board president Mathieu Cousineau. "The condominium segment -- against all expectations -- is on the verge of moving into a seller's market too."